I have a friend who does a mental juggle about whether the sweet offerings will pass muster, before she decides on the savoury part of ordering at a restaurant. Well The Conservatory’s winter special menu dessert at Cellars-Hohenort in Constantia would have no problem “qualifying”. 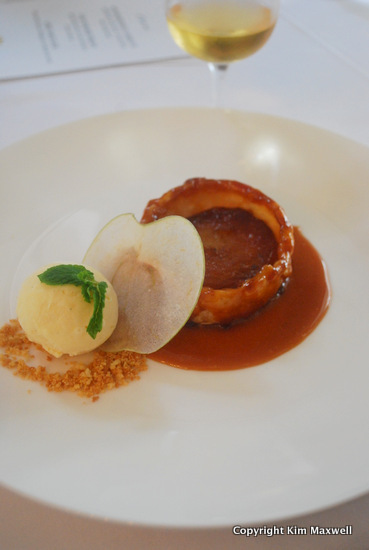 The sticky apple tart tatin is just right for one, a whole Golden Delicious apple encased in its round flaky pastry case, gooey-thick salted caramel sauce giving it an edge. It’s served with a scoop of homemade vanilla-pod ice cream. The ‘Cellars winter special’ includes two courses at R155 per person, or three at R190. There are cheaper Cape Town winter menus to be found, but I like this one because it’s not a static three-courser dragging over a couple of months, so it doesn’t feel like the chefs are cutting corners, and diners experience a gracious hotel setting with glimpses of the magnificent garden through the windows. An extra amuse bouche arrives too – mine was a comforting creamy soup with high notes from bits of pickled scallop and shimeji mushrooms. The Jerusalem artichokes are grown in the vegetable garden. There about six starter and main course options on the current Conservatory menu - limited yet sufficiently varied - which means chefs can tweak the menu for new produce. 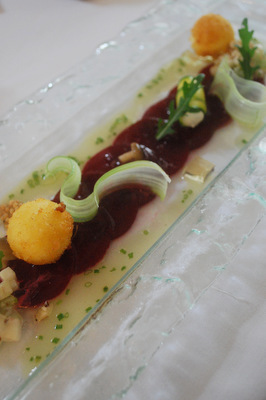 I loved the beetroot salad, served carpaccio-style with flavour accents in blocks of peartizer jelly, a clever pecan-waldorf salad, and crumbed deep-fried balls of moist smoked chevre cheese. 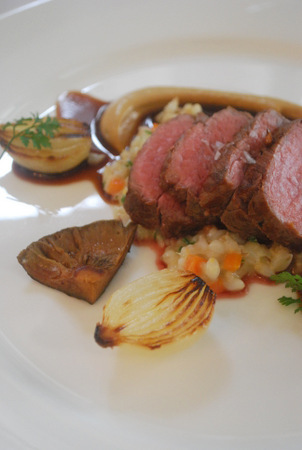 My main course was tasty beef sirloin, seared and tender from sous-vide slow cooking. A bone marrow reduction added salty-savoury tang, working well with locally-foraged pine ring mushrooms, and a plainer pearl barley risotto. Interestingly chef Chad Blows created the dish, a variation of the creation that recently won him the Chaine des Rotisseurs Young Chef National champion 2013 title. Other starters include the likes of duck liver parfait with toasted brioche and baby leaf salad, while main courses extend to seared springbok rump with celeriac puree, red cabbage and boulangerere potato. There is a vegetarian option in wild mushroom and mascarpone risotto too. The menu is available at lunch and dinner, until 31 August 2013. Quote ‘Cellars winter special’ when making a reservation. THE CONSERVATORY, Cellars-Hohenort, Constantia. Tel 021 794 2137. Lunch or dinner: two courses at R155 or three courses at R190. (Including a wine carafe at R195 or R255).